For years, many of my younger patients would come into the clinic displaying a slew of similar symptoms; crooked teeth, narrow palate and arches, dark circles under their eyes, long faces, and their mouths open with their tongues hanging out of their heads. What I didn’t realise at the time was that there was one vital link that would connect them all together. Before the time of what I call my dental awakening, I remember making a note of how many children visited me for dental treatment in a one week period who had some form of malocclusion (crooked teeth), and it was something astonishing at around 90 per cent. 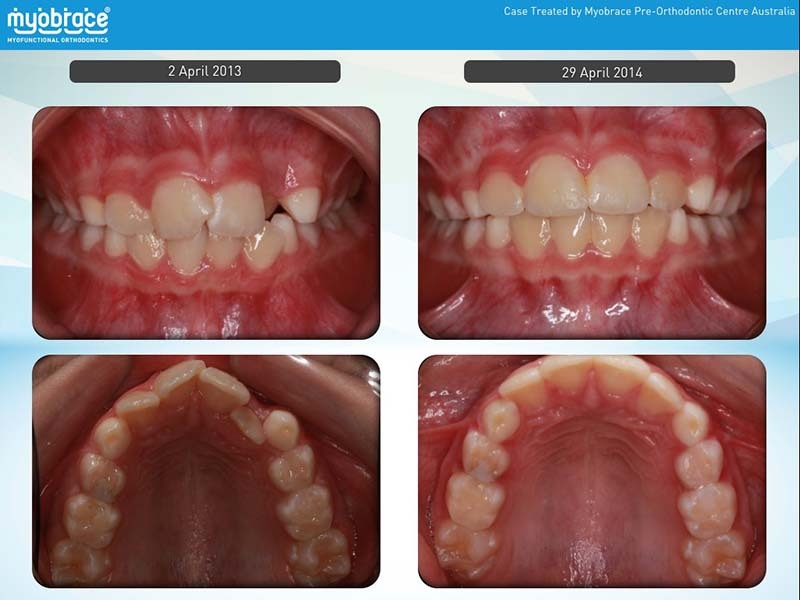 With the signs of crooked teeth being seen in my patients as young as two and three, this led me to ask the question – is there something we can do for these kids now, to lessen the severity or need for fixed orthodontics (braces) in the future? So, with my faith in specialist orthodontists, and to humour my inquisitive nature and that of the parent, I would send my child patient off with a referral to find out if there was some early intervention orthodontic treatment which could be carried out but alas, to little avail. Occasionally there would be talk of the use of an expansion appliance, but more often than not, the general consensus was to wait until all the deciduous (baby) teeth had fallen out which occurs at around the age of 12 to 14. The plan would then be to place the child into fixed retractive orthodontics, usually after having healthy teeth removed in order to achieve a straight result. Would the teeth be straight? Yes. But we now know that the art to orthodontics and orthopaedics is so much more than simply having straight teeth. This approach of waiting years until the child’s deciduous teeth had all fallen out never sat well with me. So, I set out on a journey to learn why it is that children have crooked teeth at all, and what I found was game changing. This was the beginning of my journey into Orofacial Myofunctional Therapy and Myofunctional Orthodontics (Myobrace). Did you know that three out of four children have crowded teeth and incorrectly developing jaws? We used to think that crowded teeth, incorrect jaw development and other orthodontic problems were caused by children with big teeth in small mouths or hereditary factors. But modern research has shown that in fact it is incorrect oral function such as mouth breathing, low tongue posture, tongue thrusting, a reverse swallow pattern and digit (thumb) sucking that leads to the development of many of the orthodontic issues we see today. Allergies such as allergic rhinitis (hayfever), asthma and an open mouth posture also contribute to incorrect jaw development. Growing up, many of us may have experienced one or more of these myofunctional problems, which may have been the cause of incorrect dental and facial development. The traditional way of getting braces once the jaws have already substantially developed, with or without extractions, does not address the underlying causes of the malocclusion. Therefore, we commonly see teeth relapse, and move into positions similar to where they started, because we have not corrected the improper function that caused them to be crooked in the first place. Which is also why treatment with braces commonly results in the need for life-long retainers or fixed lingual or labial wires. But with all this being said, it doesn’t mean we are against the use of braces altogether. In some instances, where a myofunctional approach such as Myobrace is not suitable or enough to achieve a perfect result, we may still incorporate the use of fixed braces into the treatment plan to achieve an optimal result. The Myobrace myofunctional orthodontic system is a no braces approach to straightening teeth and achieving correct facial development. 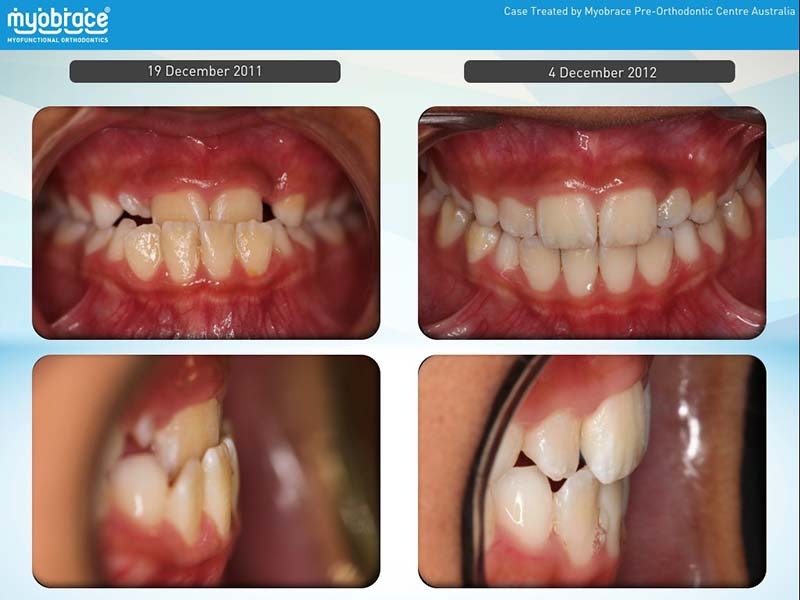 The Myobrace treatment uses the philosophy of myofunctional therapy techniques in a simple and streamlined approach to address poor orofacial habits that are the real underlying cause of crooked teeth. The mechanics of the treatment uses light forces from the tongue and surrounding orofacial musculature in a correct manner to align the teeth and arches correctly. It is arguable that this approach could be considered new and emerging, but myofunctional orthodontic techniques such as the Myobrace system and similar have been practiced by Orthodontists and Dentists around the world for over 50 years. The Myobrace system uses a series of removable dental appliances that are worn for just one to two hours each day and overnight while sleeping. However, simply wearing the Myobrace appliance won’t achieve the desired outcome alone. The system also focuses on a series of myofunctional activities to assist in achieving straight teeth and good facial development. This is where my role as an Orofacial Myofunctional Therapist comes into practice, by working with my patients on a series of daily activities to improve breathing, muscle function and tongue posture. Ultimately this will result in straighter teeth and improved muscle tone and function, leading to optimal facial development and a healthier smile.